The Intelliscanner has been miniaturized, and now it's called the Intelliscanner Mini, a palm-sized barcode reader to keep you organized. It's quite a bit smaller than the last time we saw it, and now it's been voted Best of Show at MacWorld 2007. Using its included software, you can automatically organize just about anything that's been tagged with a barcode. 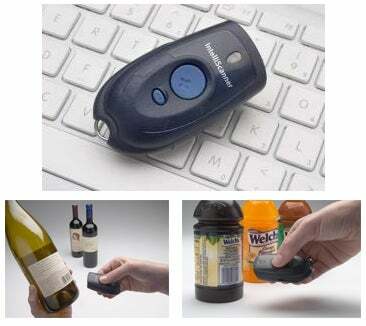 The $299 device clips onto a keychain, and opens up the world of barcodes to you. Scan your DVDs, groceries, wine, comics and a lot of other stuff, and the Intelliscanner stores all those codes in its flash memory. Then plug the Intelliscanner into a USB port on your Mac or PC, and download all that information into a searchable and sortable database using the variety of included software. Careful: could lead to compulsive scanning.